One of the things I looked forward to on this journey is eating at the local eateries and learning about regional specialties. Good Luck You Can do It!!!! Noooooo….Step away from the Starbucks!!! Well that would count as a regional special. Didn’t they start in WA or is it OR? your buddies at the gym are ‘pulling for you’. be safe and have fun! Holly cow. This is now “real”. I actually miss you already! Remember to smell the roses along the way. Good luck! 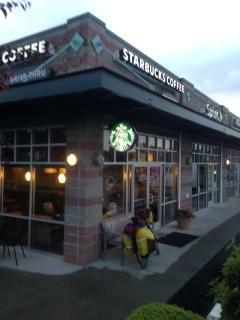 Starbucks is considered local in Seattle! Nice start Ken…go get ’em. You da man. That’s not very survivalist of you. Impressive trip. Saving on air fare? Safe pedaling.